The London Job Show is on 31st March and 1st April and showcases some of the very best employment and training opportunities from the region’s most respected International, National, Regional and Local Employers. The show is the UKs busiest Jobs show and offers Free workshops and career clinics. 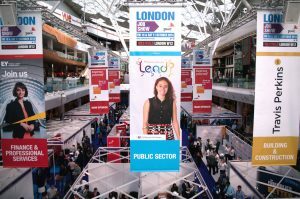 The London Job Show provides direct access to a huge range of vacancies across numerous industry and business types from entry level vacancies to senior exec level. Entrance to the event is FREE to all visitors and provides the ideal opportunity for employers and employees to meet! The show consists of “Talent Zones” which focus on specific skills sets and experience. Each “Talent Zone” has a sponsor and will be clearly identified when you get to the show… don’t forget that there may also be a presentation, clinic or workshop addressing your specific needs and expectations. With no need to register, just put the date in your diary and turn up on the day. The Jobs Show is hosted at Westfield in London and the address is provided below. For further visitor enquiries please call 01908 843646 or email: info@londonjobshow.co.uk. You can also visit their website londonjobshow.co.uk for more information.